Early on, Truman‘s father assigned him to learn to play fiddle like his great-uncle, a one-room school teacher in the mountains of Georgia. This began an extended process of trial and error including a few years of childhood violin training, a few years residence in Appalachia, etc. On his father’s 90th birthday, he played Ol’ Dan Tucker and was rewarded with, “That’s pretty good” (after years of “Nope”). In between, he had studied traditional fiddle styles, played hundreds of tunes and songs, forgot lots of them, made up some, etc. He has been most influenced by J. P. Fraley, Woody Guthrie, Western Virginia fiddle conventions, the Rounders, Tommy Jarrell, dreams of Grappelli… and “Pa” Ingalls as described in Laura Wilders’ books! Tru’s pursuit of frontier fiddle techniques has enabled him to fiddle and sing, or even call dances, at the same time, and he loves getting people involved. The collection, Songs and Tunes of The Oregon Trail , with Jane Keefer, sold 1000 copies as a cassette tape, and is now on CD at Amazon. 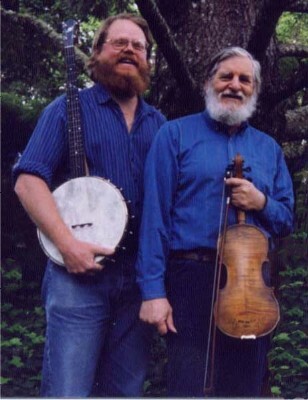 The Luckiamute River String Band grew out of string band classes he taught. Truman calls oldtime dances, squares, etc., and was artist-in-residence for 60 weeks in various Oregon schools, teaching square & circle dances with live fiddle music. He taught at least 5 dances each to about 14,000 children. He is an antiquarian bookseller, with specialities in children’s literature (with Suzanne’s expertise) and folk music, and maintains a small farm with a few Jersey beef. A more or less accurate newspaper feature about Truman’s fiddling was published in the Salem Statesman-Journal 9/28/08. John Wesley Messinger has rambled the Great American West most all of his life, but came of age in Dare County, North Carolina. That is where he had his first and only banjo lesson (what WAS that girl’s name? She sure had a nice banjo…). The style is oldtime southern clawhammer. I’ve never heard anyone better at it. Wes also performs strange ancient ballads, traditional songs of the American West, and is a fine, reckless, rhythm guitarist. Interesting stuff. He is a field botanist by trade. Truman and Wes played fiddle and banjo together for twenty years, bouncing tunes and songs off each other without even trying. They both began with immersion in Appalachian fiddle tunes, but were easily distracted: Western Swing, Swing, rags, Mexican polkas, folkloric tunes, Scandinavian tunes, the Rounders, anything loose and vigorous, or just catchy. Both sing while playing. If needed they produce old-time square dances, taught and called on the spot. Wes’ banjo style is outstanding for the dances, being dynamic, rhythmic, melodic and fast, all at once, and his memory for the lyrics of obscure ballads is remarkable. True West performed countless times for audiences of every size and kind, including many three-hour sets of authentic music of the pioneer era for the Champoeg Harvest Festival, Mountain Men Conventions, receptions and many other events, and a Saturday night show at the Old World Deli in Corvallis every week for several years..
Tim Crosby has played with Truman or True West for at least 50 gigs. Tim is a gifted multi-instrumentalist in many styles, on fiddle, banjo, guitar, mandolin, bones, grin, pick. He has played with the trio Briarose for many years, and has released a solo CD of original and traditional cowboy songs, “Crystal Creek” by “Slim Crosby”. He has played Irish music for years with The Flying O’Carolan Brothers. Since 2005 Tim has been so busy at major gigs with the hot bluegrass band Phoenix Rising that it is sometimes hard to book him. Tim & Tru have enjoyed evenings which included a brief concert, followed by an oldtimey dance, followed by a campfire singalong, as a duo. Like the rest of us, Tim loves meeting people and gathering music lore. Paul Clements and Truman first played together near Blacksburg, Virginia, after raising a log cabin on Jude Deplaze’s farm… 35+ years ago… Paul has been an Oregon State Forester for quite a few years, out of Eugene. He is wild and knowledgable, an exciting fiddle and guitar player, and we have been fortunate to have played several gigs together recently. An artist. Paul also plays regularly with Wes in the Eugene contra dance band, Barnstormers. Jane Keefer, despite her PhD in Theoretical Chemistry and Physics (or because of it?) and brief career as a computer programmer for NASA, made her living for eight years by teaching folk music around Salem, Oregon (try that sometime!) She plays and teaches folk styles on fiddle, banjo, dulcimer, guitar and mandolin, also plays hammered dulcimer, autoharp, pian, etc. She has transcribed music for over 2000 traditional tunes in both notation and written tablature for the main string instruments. While working on the East Coast for several years she developed the Folk Music Index, which lists and indexes all folk music on record, with @ 70,000 entries, plus thousands of entries regarding performers and printed materials, all based on her personal collection. Jane lives in Portland, where she teaches string band classes, performs with General Strike and is active with the Portland Folklore Society. Her 50-tune collection of fiddle tunes, in fiddle, banjo, mandolin and guitar versions, was published by Mel Bay in 2011. We played together frequently when she lived in Salem, still do occasionally, and always love the music. Taco, nee Don Austin is an absolute virtuoso on the washtub. He does not thump or thunk: he plays notes, including sizzling chromatic runs; if we are in a swing number, he takes solo breaks. I’ve never seen anything like it, and I don’t know how he does it. Neither does he. Years ago he was a regular member of the True West Band; later he played most of the colleges in the Northwest as half of a duo, Austin & Ehart, tub and mandolin. Don makes up interesting songs, has a wonderful Brechtian voice, and is also a real nice guy. He has a four-piece rock band (tub-led, all original), and in his spare time directs theatrical productions — many of them. The True West Band is semi-retired, although we resurrect occasionally. We’ve played hundreds of local gigs in Oregon: authentic music(s) of the frontier, from Appalachian fiddle tunes along the Oregon trail into the West; but and many influences along the way — ballads, blues, Scandinavian tunes, Norteno polkas, swing, etc., more below. We also did many old-timey dances, including the dance calling. The core of True West for years has been Truman Price, fiddle, and Wes Messinger, guitar and banjo. We often performed as a trio: Truman, Wes, and either Don “Taco” Austin, Tim Crosby, or Paul Clements (see “Some Folks” below). Or a quartet. Or with other good musicians. Sometimes with son Adam Price, who lives in Seattle, on banjo (see youtube bits below). We never advertised. Performances are due to word-of-mouth encounters, but we’ve done hundreds: outdoor festivals in the summers, weddings, libraries, for years a second-and-fourth Saturday of the month 3-hour gig at the Old World Deli in Corvallis. Good practice.